It's MY week, bubs. Yes, I picked all the cards to review for this week because I seriously want to address some misconceptions surrounding unnecessary hype. And what better way to start this off than with our over-estimated friend, Eradicator Gauntlet Buster Dragon. At any point during the Main Phase, you can Counterblast 2 Eradicators and the opponent retires a rear guard of their choice. He also gains 3000 power and 1 critical every time this happens in Late Game. First, the good points. His Limit Break is at least free, and the skill is at least somewhat efficient. You may scoff at the idea of giving the opponent choice, but any unit they replace it with comes at the loss of that unit's shield most of the time, since they can no longer use it to guard. Now let's talk crappiness. Any sort of ability that involves gaining Critical is rather pointless since Critical Triggers are a thing; since the opponent won't let you end a game on chance, they'd have to guard your Vanguard regardless so it's a waste. I mean, I suppose if you got horribly sacked to death, the extra Critical may have a bit more significance since you might squeeze a hit in, but only if they're on 3 or below damage. Higher and it doesn't matter. The best you can hope for is if you used his skill more than once for a Critical of at least 3, which could sort of recover you or at least force the opponent to guard early, but it's kind of a moot point since it does not address the issue of you being literally unable to take any more punishment. You have to continue minusing yourself guarding them which will outweigh their initial early guard. Next is the horrible mistakes people make with this card, which to me explains how Eradicators aren't making as much of a splash to me, despite the fact we can run 4 Descendant, unlike Japan. It's common to see this alongside Descendant in the same deck, with the idea that GBD can "soften the opponent up before you drop EDD" but this is an awful idea. GBD is eating the Counterblasts that Descendant needs to power himself up and make his re-standing actually deadly. An extra stand, and indeed the extra Crit means jack if both attacks are easy to guard. It is more practical to just play as normal with a Critical heavy deck and drop Descendant on Vowing Sword Dragon to drive the pressure home. If you must run him, max him and Vowing, but don't run him with Descendant. GBD can maybe do better with Descendant, but Descendant won't do better with Gauntlet Buster. So we kick off our “cards-that-sound-good-on-paper-but-don't-hold-up-compared-to-existing-things” week. And to start this week we get Eradicator, Gauntlet Buster Dragon. For this card to be on the list, quite frankly, I am deeply floored. Having been on the opposing side of this bad boy I can say honestly this thing is a nightmare when the opponent plays it at just the right time like when they ride it on top of Eradicator, Vowing sword dragon. 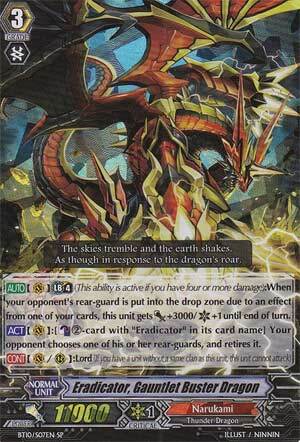 If you ride this unit over "Eradicator, Vowing Sword Dragon", the Break Ride will retire a rear-guard, and this unit will get its Limit Break for free. The absolute worst situation is when Fiendish Sword Eradicator, Cho-Ou is called to the rear guard or worse 2 of them. If these conditions are met you have a very terrifying Buster Dragon with 3-4 criticals depending on the scenario (having experienced this on a weekly basis I assure you it’s a nightmare if you don’t have a sentinel (perfect guard unit) this tends to leave you with no intercepting units and no boosters. And this is all BEFORE he uses his counterblast ability. Before an attack with all of these abilities which have activated, I have seen EGBD break 40,000 and 4 criticals. In a deck built around him he is truly something terrifying. If you are using a different build, it might not be as effective, but even so, he’s a right pain to deal with normally in a Narukami deck. If he’s in the deck for support: 3/5. [AUTO](VC) Limit Break 4 (This ability is active if you have four or more damage):When your opponent's rear-guard is put into the drop zone due to an effect from one of your cards, this unit gets [Power]+3000/[Critical]+1 until end of turn. [ACT](VC):[Counter Blast (2)-card with "Eradicator" in its card name] Your opponent chooses one of his or her rear-guards, and retires it. The other effect that Gauntlet Buster has is that you Especial Counterbast 2 to force your opponent to retire one of their own rear-guards, so essentially, it's like Demon World Marquis, Amon's effect of retirement, which in itself is pretty nice though the restriction of it being a Especial Counterblast does hinder it and prevent it from being use in any Narukami deck (damn...), but given the consequences, it's probably better off. Given the theme, I'm assuming that we are comparing this to Eradicator, Dragonic Descendent, but personally, I think Gauntlet Buster actually fits the Narukami characteristics more than Descendent, and while that doesn't make it a better card than Descendent, it does help it in being just as much, if not even more of a threat, when combined with Vowing Sword Dragon, Cho-Ou and other cards that can cause retirement and trigger off the Limit Break. **Gauntlet Slam should TOTALLY be a move in the WWE!